I run 7mm spacers up front with 8" wheels ET52 on 235 rubber. - At rear 12mm on 10" ET65 on 285 rubber. The amount of camber that your running and the brand of tyre will have an effect on how it looks. - Yoko AD08R for example has a very square profile, almost 90 degree from side wall to tread, while Cup2's are far more rounded from side wall to tread. my spacers are H&R hub-Centric. In regards to longer bolts, I run Rennline Studs, which I find excellent and make removing and refitting wheels significantly easier. 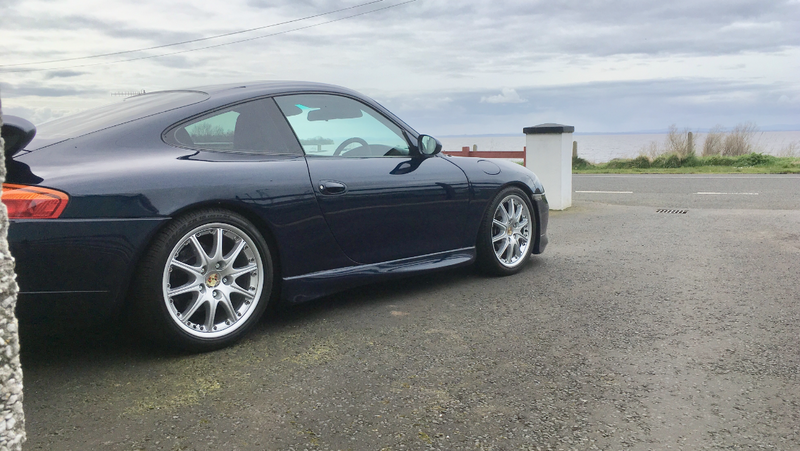 Ride height is the GT3 -3mm which may be to low for you, but I get no real issues, the odd scrape on the front splitter, but I run a Cup splitter so its a little lower than an aero/GT3 item. Studs look like a great job. Didn’t look at off set but my front wheels are 7.5 with a 235. Rears are 285/30. Not sure on rim width but the tyres are p zero’s and sit way over the rim edge. Fairly well settled on 7mm front and 15mm rear spacers. Haven’t got round to getting them yet as I’m doin other small bits. 235 are a little wide for 7.5" 225 would be better suited. If you have 9" 285 is to wide, 265 would be better suited, 285 works well on 10"
The above may help explain why the tyres sit way over the rim edge, however it could also be tyre design/shape. Finally got the springs and spacers into the car. Had a few issues along the way. I had 1 broken stud in the rear which was very easy to deal with but first a bigger issue. Some idiot had over tightened the wheel nuts, I’m assuming the broke the rear 1 putting it on. I broke the lock nut, welded it and broke it again. Then I broke the breaker bar on the normal studs. To say I was pissed off was an understatement. Bought a lock nut removal kit and new breaker bar. Job done. The rest was handy enough. I’ll be out for a good run today to get the full feel but it looks good. Aiming for the same with mine, hopefully soon. m030 springs have green and white dabs. 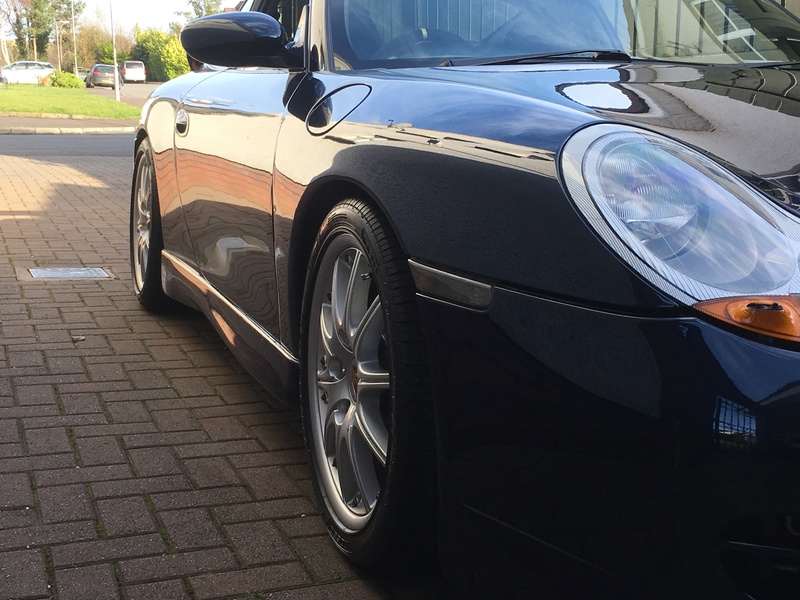 all 996 came with bilstein made shocks, but only porsche markings on the oe ones. sounds like yours had new front shocks sometime if they are marked with the bilstein part number. Can’t remember what colours they were now but they’re sitting in the garage and I can check easily enough. I’ve always thought the suspension was very hard so I’d assume it’s definitely m030. Can’t imagine a standard car would be so stiff. And really would be surprised if a gt3 was much harder, sure it’d work 10 times better but a factory car couldn’t be too hard or it wouldn’t sell. The spax springs are a lot softer to fit, more coils but definitely easier to compress. Not really sure on the difference on the road but I had the kids with me yesterday so there were no heroics. As I said I have made my rear arb adjustable but they are worn at the bush area so I’ll have to address that and I’ll also need adjustable toe arms. After that I’ll just start to rebush it, front first. Not sure how I’ll do this, I’d like to go polybush but the idea of just bolting in new meyle parts is very appealing. Have you had a 4 wheel alignment done?